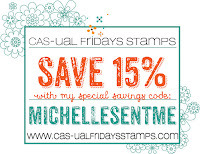 I chose to use the beautiful "Tutu" Stamp set from one of our generous sponsors CAS-ual Fridays for my card. I stamped her out with Suede Shoes CP Ink and coloured her in with Prisma pencils. If you would like to purchase anything from the CAS-ual Fridays shop, feel free to use my special discount code for 15% off. 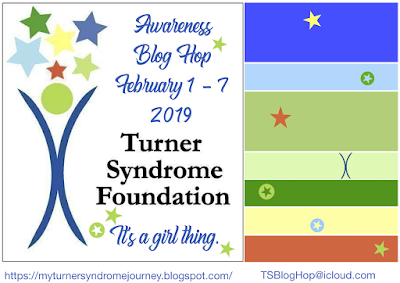 Remember to visit "It's A Girl Thing" Turner Syndrome Awareness Inaugural Blog Hop page to become eligible for prizes. Michelle ~ Thank you for being a part of this Blog Hop! I love your beautiful ballerina! The sparkles look wonderful with your gorgeous girl!! Oh my, Michelle! The perfect little ballerina expressing herself so beautifully! Your sentiment brings out even more of The Happiness we can all enjoy in life. LOVE LOVE LOVE the dearness and strength you bringing out in this wonderful creation! Leaving you with wishes for a wonderful day. Beautiful creation with one of my fav stamps! I love the colors and sentiment - perfect for the occasion! This is such a pretty card. Your little ballerina is spreading joy as she dances! This is absolutely gorgeous!! I love the beautiful ballerina!! So pretty with the stars!! Awww....what a sweet card! Perfect for this hop! What a pretty ballerina!one of my favourite from CAS Friday! An elegant card!! Awe, she is so cute. So beautifully CAS. Love your adorable little ballerina and awesome card...very pretty! Adorable card. I love how you used blue for the silhouette! Thanks for the inspiration. aww this card is so sweet - thanks for sharing!! Your CAS card is gorgeous. Love the glittery stars and the blue silhouette - so sweet. This is really sweet and colored beautifully. Love the added sparkle, too. I love this ballerina! CAS designs are great! Thank you for bringing awareness to this syndrome and being a part of this hop! your card with the lovely ballerinagirl is magnificent for this TS-bloghop! Sweet sweet card. Love the stamp images used. Thanks for supporting such a good cause (which I was unaware of). OH MY WORD! This is just precious and perfect! LOVE your design! Thanks for helping to spread the word! This is a darling card! I love the bright flowers and the simple feminine look. Thanks for being part of this important hop! Just beautiful! It is so clean and simple. The dimension is gorgeous. Perfect CAS card with awesome colors! Wonderful card, love the little ballerina. 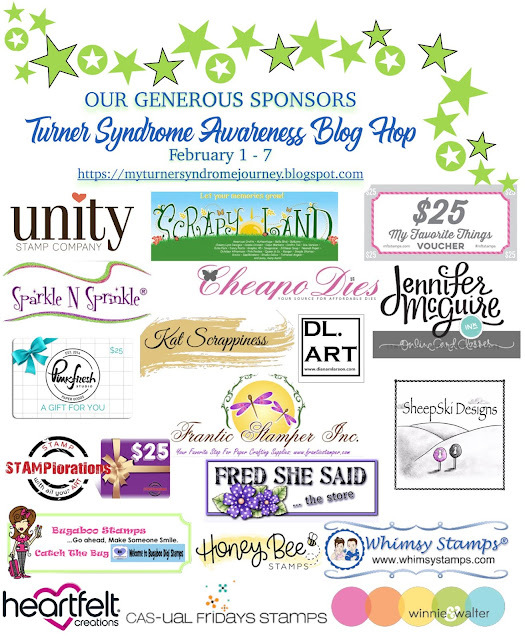 Thanks for bring awareness to Turner Syndrome. PS Now I'm humming the song "Tiny Dancer" (from the 70's I think) !! I just love this cute little dancer. It reminds me of my own two girls! cute card and a reminder for all of us! Your card is fab!!! I love your ballerina and the stars just pop against the white background . Adorable card! Love that little ballet dancer! I love that stamp and your card! Her tutu of flowers is so pretty and that sentiment is just perfect. Thanks for sharing this cutie! What a super darling card!!! Love how the stars give this cutie-patootie movement! Oh what a sweet and happy card! Lovely clean design. I love your card, and the vibrant colors you used. Thanks for sharing. The little ballerina is so perfect with those colors. What a fantastic card. I love the CAS design of it too. That is more my style! Your card is so sweet, great colors! Adorable Dancer and how you made it shine with the stars. Thank you for helping Lori with this endeavor. Oh my! How cute!!! Adorable and sweet card!!! What a cute card. Great CAS layout. Your flower tutu card is so pretty and sweet!!! Totally charming. Such a beautiful stamp & I love how you colored those flowers! oooooh I love love LOVE this awesome card! The tiny ballerina with the flowery tutu looks so darling! I LOVE that stamp! hanks so much for being a part of this amazing blog hop today! This is so cute. Love this ballerina stamp. Your card is really elegant and the wording is from your heart. Thank you for taking part in the Inaugural Turner Syndrome Awareness Blog Hop to make us aware that such a condition exists among girls. Thank you for encouraging these butterflies to fly. May you be blessed with gd health and happiness always. Hugs and loads of love from Sri Lanka. Such a precious little ballerina! I love your card! 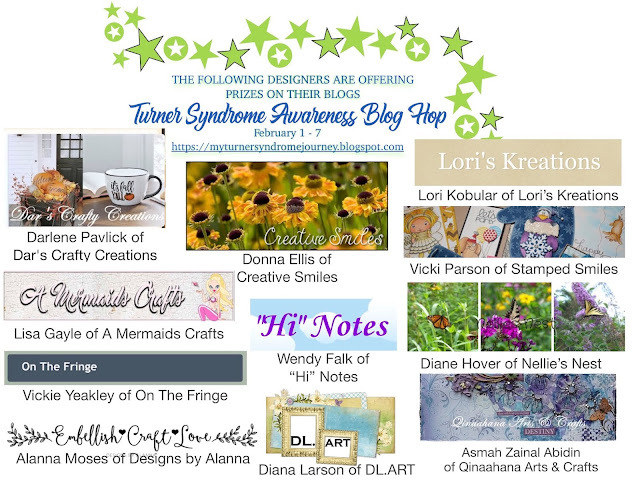 Thank you, Michelle, for taking part in this special blog hop and sharing your work with us. Oh my goodness...such a lovely card! You are an Angel for doing this blog hop! CAS-ual Fridays Mon Ami and coloured pencils.